In the early history of Japan, Nara prefecture was the center of the politics, the culture and the economy in Yamato Period, Asuka Period and Nara Period. Japanese people just believed their animism, the origine of “Shinto”（神道） until Asuka Period. 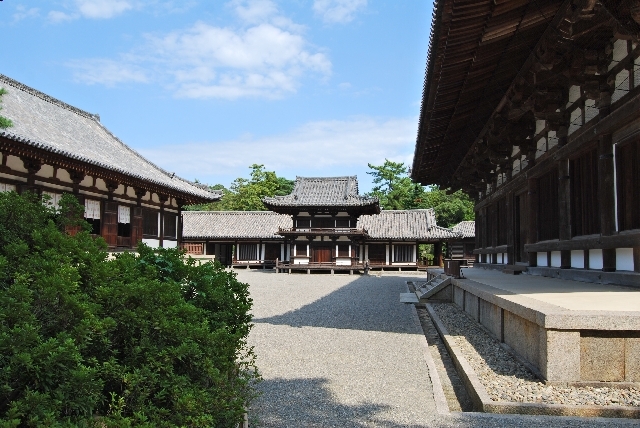 Horyuji Temple is the oldest wooden structure throughout the world. It is also called “Ikaruga-dera”（斑鳩寺）, connecting with the name of the district. Yomei Emperor(用明天皇） hope to build the temple and Buddha statue for recovery from his illness. The area is 187,00 square meters and can be divided into Saiin garan(西院伽藍, west side, upper photo) and Toin garan(東院伽藍, east side). The upper picture is the scene of Saiin garan which contains the five-story pagoda, the golden hall, the corridor, and the inner portal. The “Yumedono”(夢殿） , in the shape of the octagon, is placed on the east side. Less than 2km from Horyuji, there is another temple of World Heritage, Houkiji temple. 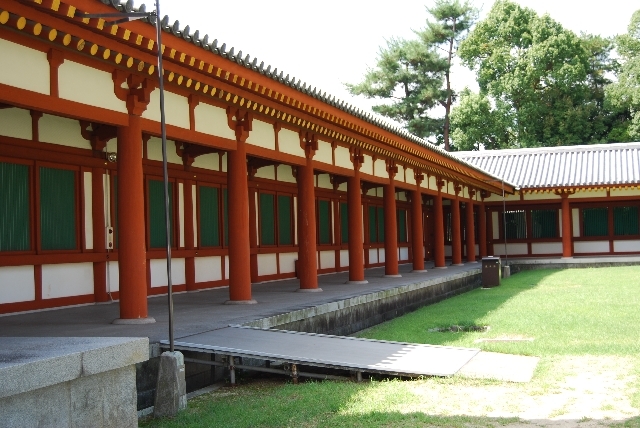 It is said that the ground had been the palace for the family of Shotoku Taishi. But on his deathbed, he ordered his son, Yamashirono-ooenoo（山背大兄王）, to rebuild it into a temple. Hokkiji has many other names, Okamoto-dera(岡本寺）, Okamotoniji（岡本尼寺）, Ikejiri-dera（池後寺）, Ikejiriniji（池後尼寺）. “Ni”（尼） means a nun and “ji” is a temple in the Japanese language. If you have been to Nara, you may have the impression of the city deers walking around. Acturally Nara Park holds more than 1100 deers. When tourists take a stroll for northeast in the park, they get find a big temple. The hall of the Great Buddha(upper photo) at Todaiji temple is the oldest wooden framework structure around the world. Shomu Emperor（聖武天皇）founded this temple in 752, the middle of Tenpyo Culture. The purpose of building Todaiji was mainly to place the Great Buddha in it. He was very eager to make a big Buddha statue of Rushanabutsu（盧舎那仏） for people and it took seven years to achieve. Throughout the history, the hall of the Great Buddha, Daibutsuden(大仏殿）, and other buildings were burned out by the fire of wars in 1180 and 1567. And the temple was restored each time. 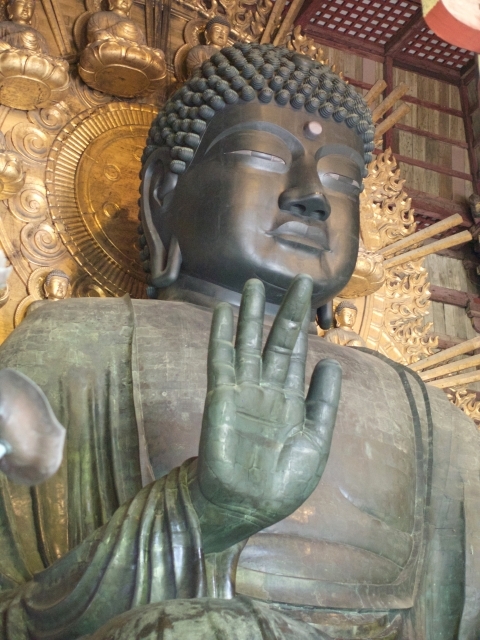 Daibutsuden and the Great Buddha is the most remarkable in Todaiji. But Nigatsu-do(二月堂）, Sangatsu-do（三月堂）/Hokke-do（法華堂）, and Kaidan-do（戒壇堂） are also too good to miss and have valuable Buddha statue. Nandaimon(南大門, the south main portal) and its Kongorikishi-zo（金剛力士像) are very solemn and grave. If you head to southwest in the deer park, the other side of Todaiji, you'll see the still more high structure, the five-story pagoda of Kofukuji. Kofukuji is the head temple of Hosso sect(法相宗), one of the Nanto six sect. The origin was Yamashina-dera(山階寺) which Kagami-no Ookimi(鏡王女）, Fujiwara-no Kamatari's(藤原鎌足） wife, founded this temple in 669 to pray for her husband's recovery from his illness. It was replaced to Asuka after Jinshin revolt in 672. And then, the son of Fujiwara-no Kamatari, Fujiwara-no Fuhito(藤原不比等), moved the temple to the Nara Palace(Heijo-kyo, 平城京) in 710 and renamed it as Kofukuji. 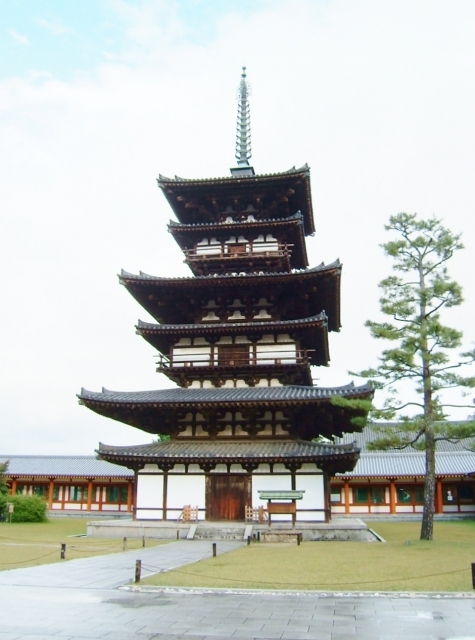 The five-story pagoda and the eastern golden hall(Toh-Kondo, 東金堂, upper photo) are the symbols of Kofukuji. And You can see the statue of Ashura and Bronze Buddha head at National Treasure Museum. Gangoji is on the opposite side of Kofukuji between Sarusawa Pond. The temple is one of the seven great temples of Nara. For the first time, Gangoji was built as Hokkoji/Asuka-dera and the structures were moved to Heijo-kyo in 718 and changed the name. It had been one of the state temples in Asuka Period and enshrined in the centre of the Heijo-kyo. But after the transfer the capital to Heian-kyo(平安京), the temple was left behind. The fire in 1451 and typhoon destroyed the most of the structure. The erosion by the houses made the temple impossible to revive completely and the ground was split into three area. Today, the two of them was lost and the place of Gokuraku-do(極楽堂, upper photo) has only remained. 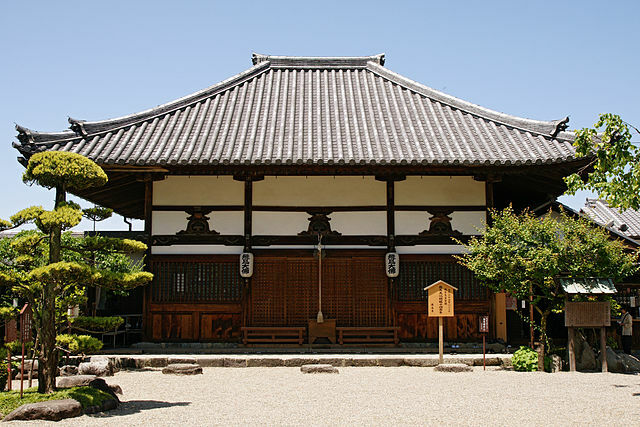 The same as Kofukuji, Yakushiji temple is also the head temple of Hosso sect and one of the seven great temples of Nara. Tenmu Emperor planned the idea of the founding in 680. The main Buddha statue of this temple, Yakushi-Nyorai, is believed to remove illness and give comfort. Tenm Emperor wished and built the temple for his wife, later Zitoh Emperor(持統天皇). There are eight main structures in the area. The east pagoda, the west pagoda, the golden hall, and the corridors are very famous. Especially, the east pagoda still remains its shape since it was built. Because of the beauty of the architecture, the structure is famed as 'frozen music'. Toshodaiji is the head temple of Rishu sect(律宗), one of the Nanto six sect. In 759, Ganzin(鑑真) who had come to Japan from China after five failure of the voyage, founded Toshodaiji for monks to learn Buddhism. 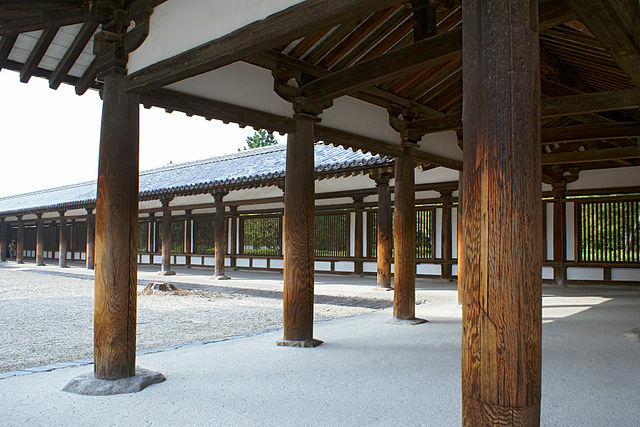 The pillar of the golden hall(Kondo) shape entasis just like the corridor of Horyuji. The Kondo contains nine Buddha statues including Rushanabutsu-zazo(盧舎那仏坐像), Senjukannon-ryuzo(千手観音立像), Yakushi-nyorai ryuzo(薬師如来立像). And in the substantial auditorium(Kodo, 講堂), there are many Buddha statue such as Miroku-nyorai zazo(弥勒如来坐像) , Zikoku-ten ryuzo(持国天立像), and Zocho-ten ryuzo(増長天立像）. This entry was posted in Buddhism Temple, temple/shrine, World Heritage temples and tagged architecture, Buddha statue, Buddha temple, Buddhism, Horyuji, Nara Period, Todaiji, Toshodaiji, Yakushiji. Bookmark the permalink.